Bond inspires Day of the Dead parade Jump to media player Mexico City has held its first Day of the Dead parade, which tourism officials say was inspired by the opening scenes in last year's James Bond film. 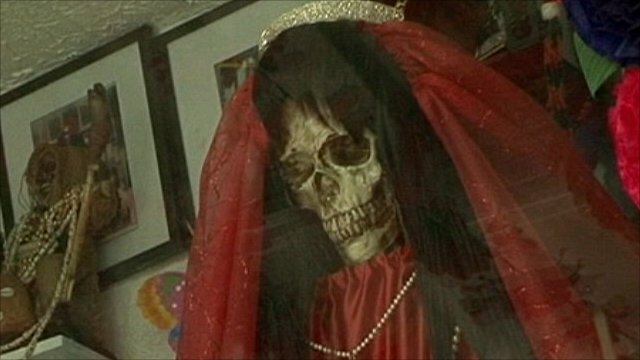 Mexico's 'Holy Death' cult growing Jump to media player A cult which reveres death is growing rapidly in Mexico and its influence is now spreading to neighbouring countries including the US. Why is Mexico City full of zombies?! Jump to media player Thousands of people in Mexico turn out for a zombie walk. Mexico City has held its first Day of the Dead parade, which tourism officials say was inspired by the opening scenes in last year's James Bond film, Spectre, which was filmed there.